We make a hundred, or a thousand, choices throughout the day that in some way affect who we are, what we are doing, and where we are going. The eggs or the muffin? The workout or the couch? Up the weight or modify it? Run the red light or stop with the safe yellow? Read with your child, or turn on the TV? Ignore someone, or turn back and swallow your fear and talk? If we thought about the impact of our choices in every moment, we would be paralyzed with indecision. But we don’t. We react and we press on. Yet, what if you changed one thing today? One thing. A choice that is normally poor, or at best, mediocre. Say, the sugar in your coffee. What if you left it out? Or the scaling of the weight right before the start of your workout, when your heart is not brave enough and your mind worries about the pain to come? 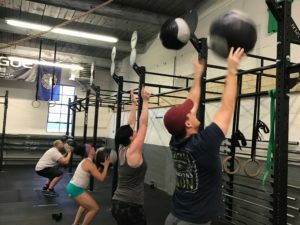 What if you believed in yourself and went with those heavier kettlebells? Or what if you decided that being late to anything was no longer acceptable? What if you left with plenty of time to get to where you need to be? Stop putting better choices off until tomorrow. Stop putting change off until tomorrow. Every day that you are less than who you can be, that’s a day you’ve wasted, for yourself and for the people you love. Life is short, you might as well make the most of every single day. Be brave. Choose better. And change.